Peter M. Kellett is Dykema’s Chairman and Chief Executive Officer. Under Peter’s leadership, Dykema has expanded its footprint into Minneapolis and significantly grew throughout Texas, enhancing firm capabilities to serve clients and matters nationally. His leadership in the Metropolitan Detroit business community is well-known. He serves as a member of the Detroit Economic Growth Corporation Board of Directors and serves on the group’s Audit and Finance Committee. The DEGC is Detroit’s leading nonprofit economic development entity made up of civic leaders, corporate executives, and other stakeholders, assisting new and existing businesses in bringing new investment to the city. Peter is also a member of the Detroit Economic Club Board of Directors. The DEC is a non-partisan, nonprofit organization committed to shaping a modern business environment through the free exchange of ideas and debate. Peter is also a leader in promoting a more diverse and inclusive business culture and environment – not only at Dykema – but throughout the region. He is a member of the Board of Trustees of New Detroit, an organization dedicated to removing racial barriers through economic equity, social justice, and racial understanding. Before being elected Chairman and CEO, Peter was the Director of Dykema’s Litigation Department. He focused his practice on class action, product liability and commercial litigation for some of the largest companies in the world. He is recognized annually for his litigation abilities by publications like Best Lawyers in America and Michigan Super Lawyers. 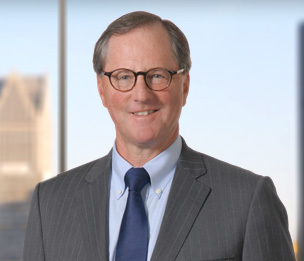 He is also known for his contributions to the legal community, as a Sustaining Life Fellow of the American Bar Foundation and a life member of the Sixth Circuit Judicial Conference. Before joining Dykema, Peter was a founding partner of Feeney, Kellett, Wienner & Bush. He is a graduate of the University of Michigan, and honor graduate of Wayne State University Law School, where he was admitted to the Order of the Coif.